Only our reservations regards actually wearing and the physical fit of the device prevent it from scoring higher. But overall, it's a quality bit of kit that mostly justifies its premium pricing. Once in a while, a product pops up that reminds you just how remarkable digital technology can be. The Jabra Motion Bluetooth headset does just that. It integrates such an impressive array of functionality into such a tiny device, you simply have to marvel at what's possible. Put another way, it's that Star Trek thing - the Jabra Motion is Lieutenant Uhura's ear-dangling comms device productionised and available to buy. That's not to say it's unique or even necessarily does its intended job well. 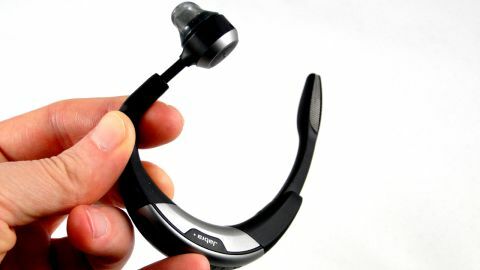 Several outfits will do you a full-function Bluetooth headset. Indeed, the critical point is that you can have a Bluetooth headset for as little as £10 – Amazon.co.uk will do you a Plantronics ML18 for just that. The most basic version of the Jabra Motion typically costs in excess of £60. On paper, both that device and the Jabra Motion do the same basic job – allow you to connect to your mobile phone via Bluetooth for hands-free calls. Question is, then, does the Jabra Motion's particular feature set and execution – its controls, its battery life, the quality of its noise cancellation – make it worth the price premium. Our review sample is the basic Jabra Motion. That means its a Bluetooth hands-free headset that will connect to any Bluetooth-enabled phone for voice calls. It has physical controls for receiving and ending calls, audio volume and mute. The micrphone itseld is on a flip-boom which doubles as a power switch for the whole device. Thanks to an extendable, swiveling ear piece, it's also adjustable for size and can be worn on both left and right ears. Digital features start with motion and environment-sensitive noise canceling. It also sports voice control both natively and through certain handsets. That means you have voice control of a number of the Jabra's own functions. But you can also use the full voice control of your handset through the headset. For example, you can access Apple's Siri voice control on iPhones with the headset. The Jabra Motion also has a few other neat frills, such as using its motion sensor to automatically answer calls when you pick it up. If this is the entry-level version, other variants add extras like a USB Bluetooth adapter to allow you to connect to PCs and support for Unified Communications (UC) which will be attractive to corporate users. Call quality, that's surely one of the biggies for any Bluetooth headset and here the Jabra Motion scores pretty heavily. Exactly what goes into the noise cancelling tech, we're not sure. But the end result is impressive suppression of car noise. If you didn't already know someone was calling you in-car and on the move with the Motion, you probably wouldn't guess. And that was with our test car which is a relatively noise cabriolet with a fabric roof. That said, the audio quality for the receiver is a little thin. But if you don't want people to automatically know you're on the road, the Motion gets the job done. As it happens, the sound quality for the Jabra Motion user is a little skinny, too. You don't notice this much in calls. But it is obvious if you try to listen to music through the ear piece. Not that you'll likely want to use it as a single-ear wireless headphone. But it does reveal the fundamental quality of the audio of offer. And it's mediocre. The other major element of the user experience is ease of use and that's a story of wins and losses for the Motion. The least satisfying aspect is physical fit. The Jabra motion is adjustable and also configurable for both ears. But we found achieving a comfortable, stable fit tricky to achieve. That's compounded if you wear glasses where the Motion and the arm of your glasses compete for space and stability atop your ear. However, we're all different shapes and sizes so our advice here is clear. Try before you buy. The Motion isn't poorly designed, it's adjustable and it may fit you very nicely. The rest of the usability package, however, is much more successful. Initial setup and syncing is a cinch, as is accepting and ending calls. Ditto volume adjustment and accessing additional features. It all works very smoothly indeed. The voice control feature is an added boon and means you can have full access to your contacts on the move and hands-free. In our testing, there was no detectable loss of accuracy of Apple's Siri voice control when on the move and using the Motion as an interface. Battery life is also good. Much will depend on usage. But Jabra claims seven hours talk time and that seems realistic. The bottom line is that you want the device to last a day on a single charge and so long as you don't spend literally every moment on calls, we reckon you'll get just that.